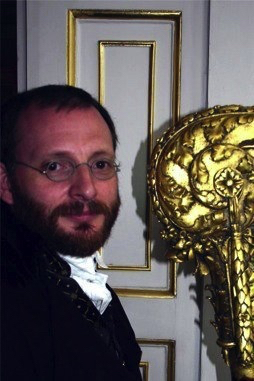 Mike Parker is a harpist and musicologist who initially studied instrument building at the London College of Furniture, building and restoring ‘early’ and folk harps. His repertoire covers many styles of music from ‘early’ and folk styles through baroque and classical and into the world of ‘light music’ and pop. He is the only Englishman to have been awarded Olamh Sui (Doctorate) by the Institute of Traditional Celtic Music, which was awarded for his work relating to the historical usage of the harp in the Celtic nations. He researches all aspects of the historical harp and modern folk music, resulting in a collection of 25 harps, ranging from a small instrument with 12 horsehair strings, through to the double action pedal harp, to enable him to use the most appropriate instrument and technique for each type of music. Mike Parker completed an MMus in Performance & Related Studies in 2003 on the single action harp, at Goldsmith’s College, University of London. A specialist on the development technique and repertoire of the single action harp (1770-1825) in 2005 he published a source book, ‘Child of pure harmony’ which has become recognised as a leading work on this subject. He is Head of Strings in the Junior Department of the London College of Music & Media (University of West London) and also teaches privately by arrangement. Mike Parker has coordinated events including the Single Action Harp Symposium 2004, and has performed widely on various forms of the single-action. He gave workshops, a paper on the German partial-action, and a performance on an Egan single-action from 1828 (kindly loaned by Dr Emily Lawrance) at the Historical Harp Society Annual Workshop and Conference (June 2008), and a demonstration concert on a McEwen French harp, an Erat Empire and an Egan Grecian at the World Harp Congress in Amsterdam (July 2008). In 2009, he played on the Egan Portable Irish Harp, and on a Challiot-crochet action instrument for the HHS in Boston. More recent, he taught a weekend course on the single-action harp at Eastman School of Music, and gave a Masterclass in playing historical repertoire, taught, and performed, at the Edinburgh Harp Festival, and also at the Harp On Wight Festival, and he is a past president of The Historical Harp Society.